Description: Capture the allure of rustic charm as a dramatic stand of Tall Pine Trees is highlighted as the morning sun rises in the background of this fixture. The decorative accents and hardware are featured in an Antique Copper finish, which are complemented with a stunning Silver Mica diffuser. 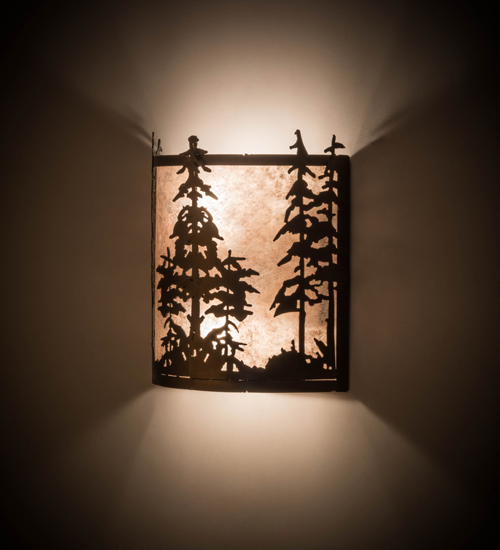 The sconce is handcrafted by expert artisans in the Yorkville, New York manufacturing facility at the foothills of the magnificent Adirondack Mountains. Custom colors, styles, sizes and dimmable energy efficient lamping options such as LED are available. The wall luminaire is UL and cUL listed for damp and dry locations.